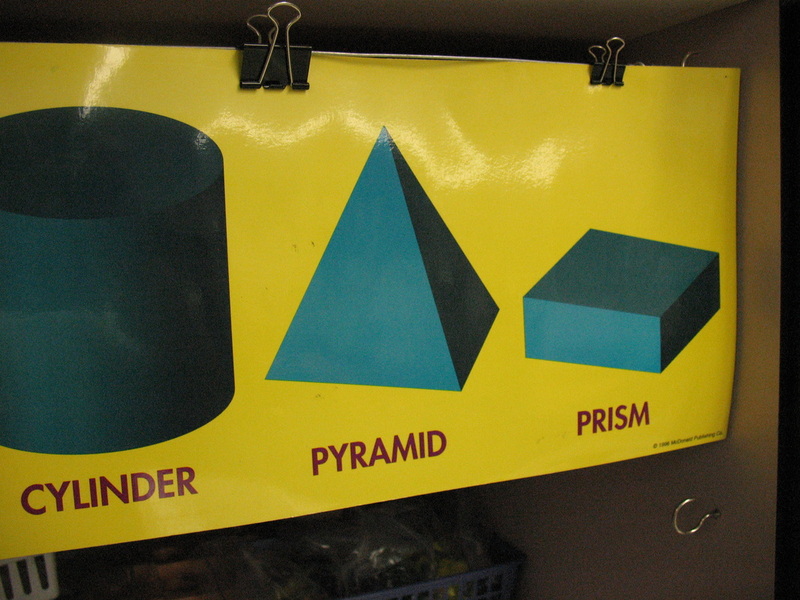 Tips and Tricks for the Elementary Classroom - What's going on in Mr. Solarz' Class? 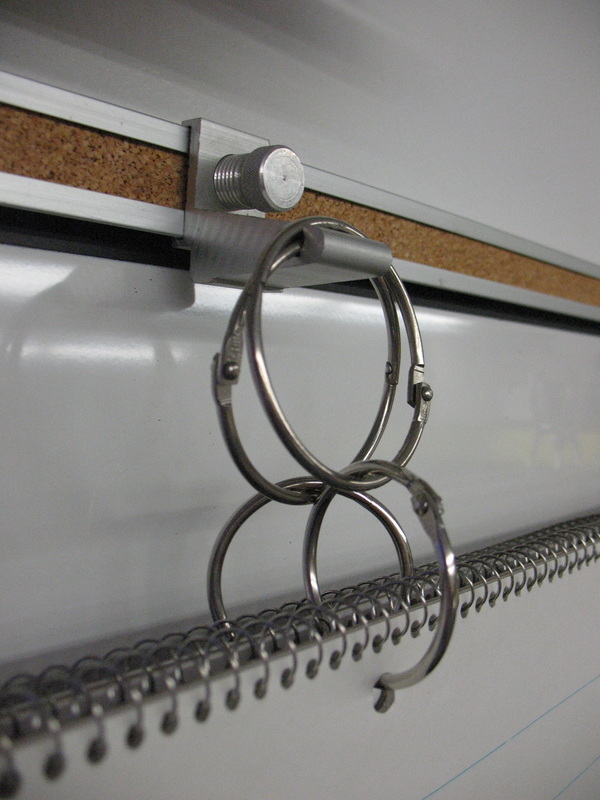 Use the metal clips that are attached to your cork strip above the white board to hang posters and chart paper! (Left): For posters, I hole punch the top right and top left of each poster, attach a "hole reinforcement sticker" and then laminate (only if you plan on using it often)! (Right): For chart paper and posters, I attach a small "metal book ring" through the hole and then attach a larger ring through that one. This way, the ring is going the same direction as the chart paper or poster and will sit in the groove properly. In order to maximize the use of brackets, use one metal bracket for the right side of a poster and the left side of another - saves brackets!!! (Left): They now make 3-D borders that you fold along perforations and the objects pop out! I can't remember where I bought these, but be on the lookout for them, because they add a nice touch to bulletin boards! 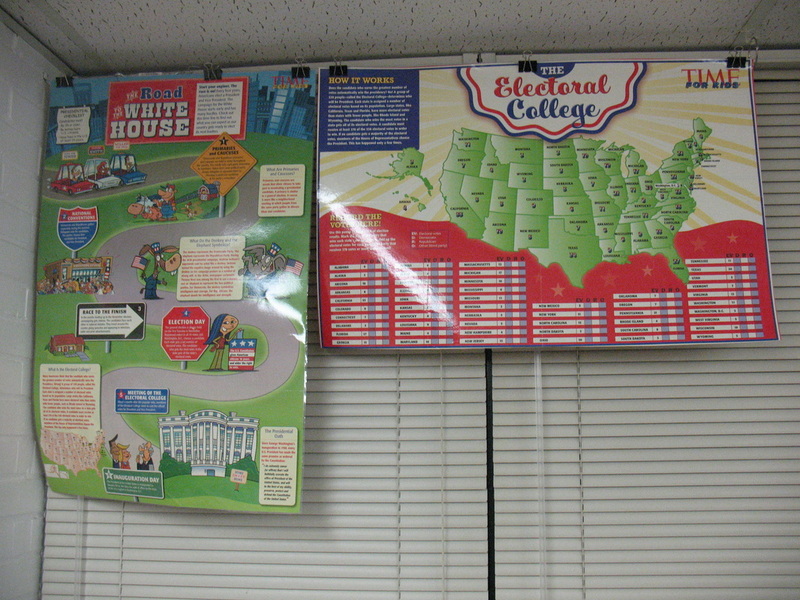 (Right): Some of my bulletin boards are used to track classroom progress towards rewards. 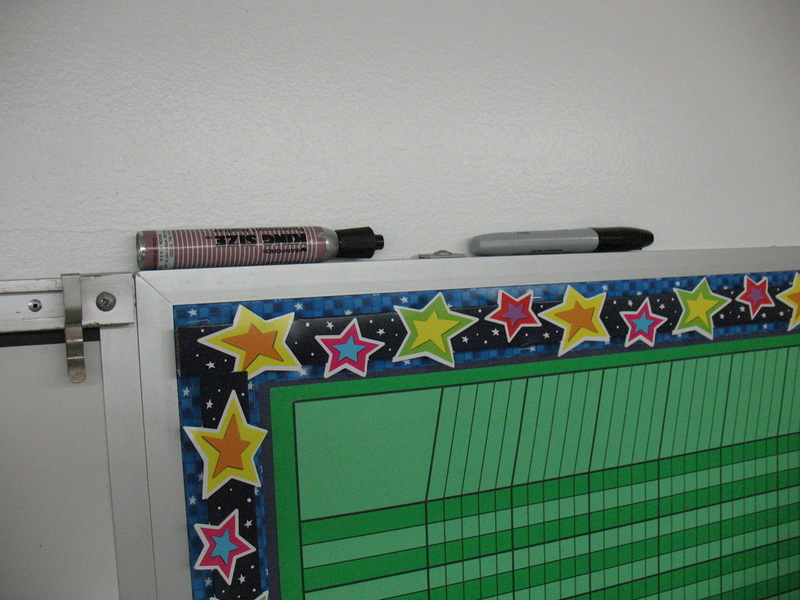 I never could seem to find a permanent marker when I needed one, so I got smart and started storing it above the bulletin board. When you have 25 students using 5-10 computers every day, downloading pictures, connecting devices, etc. the number of cords can get overwhelming. They get lost or mixed up with all the other cords. I decided to fix the problem. (Left): Each computer is assigned a purpose based on the cords it needs (photo/video uploading, smart phone charging/uploading, SD card reader, etc.). 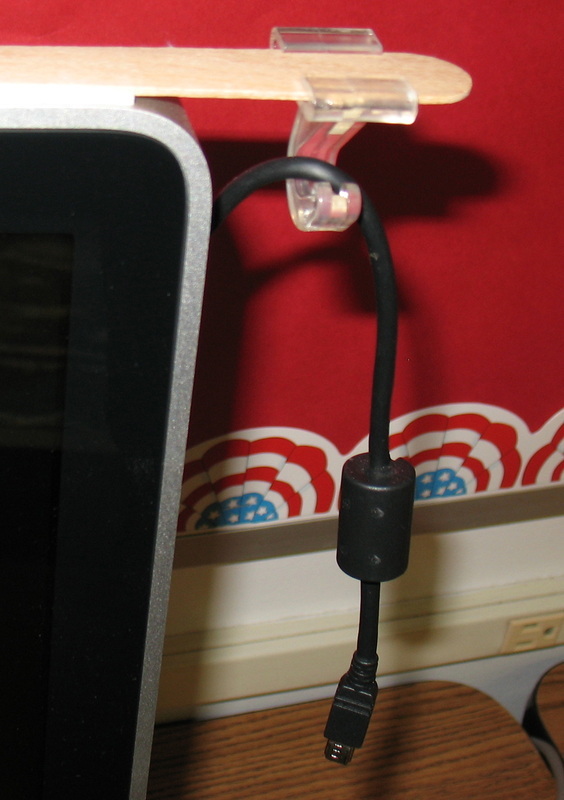 (Right): I used double sided sticky tape to attach a tongue depressor to the top of the monitor (see how it hangs over). 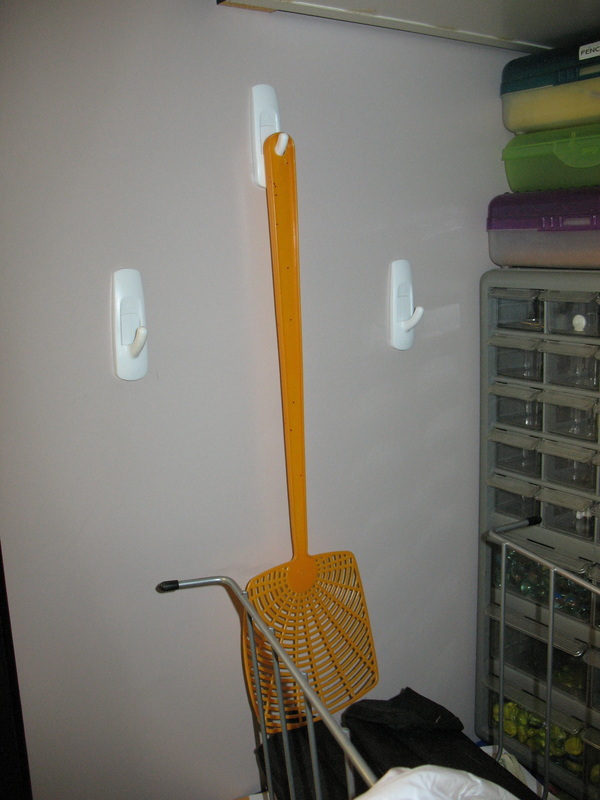 Then, I attached a ceiling hook to the tongue depressor and strung the cord over it. Now I won't lose the cord anymore and the kids know the purpose of the computer! Credit goes to Jill Richey for this one (I saw it in her room and stole the idea!). (Left): Remove the bolt currently in the access panel of the air conditioner and place it inside so you don't lose it. Tie a piece of string around the hole. 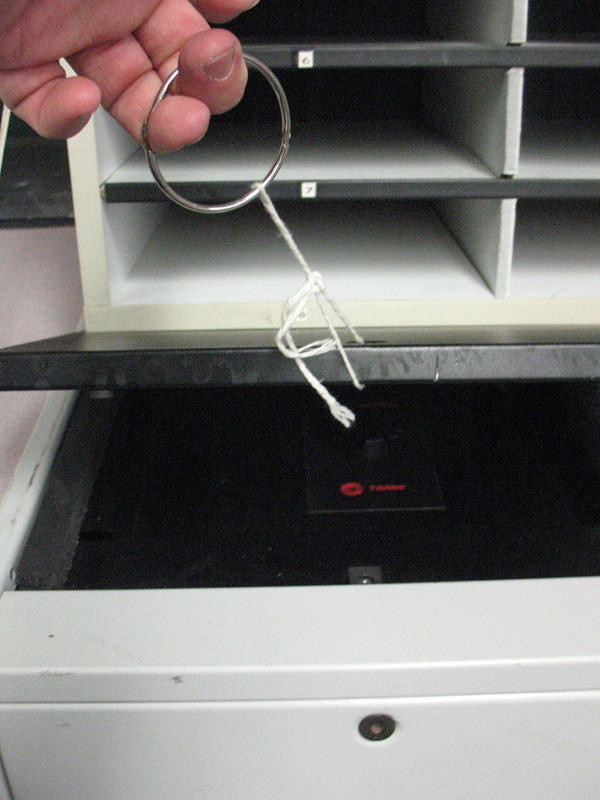 Attach a metal book ring around the string to give you something to grab hold of. Lift and adjust the settings! (Left): Open a cabinet door that is above the sink, and tape an index card or two to the inside, but let half of it hang out below. Attach binder clips to it. Wash your transparencies and clip them to the index card. They will drip dry into the sink. Good for the environment and you can fit about 10 at a time! (Left): I used a hammer drill to pre-drill a hole in my brick or cinder block. I put a masonry anchor into it and screwed in a strong metal hook. I did the same to the other side, but instead of a hook, I just put a screw in that had a large head. I twisted some heavy duty wire around the screw's head and strung it across the length of my windows. 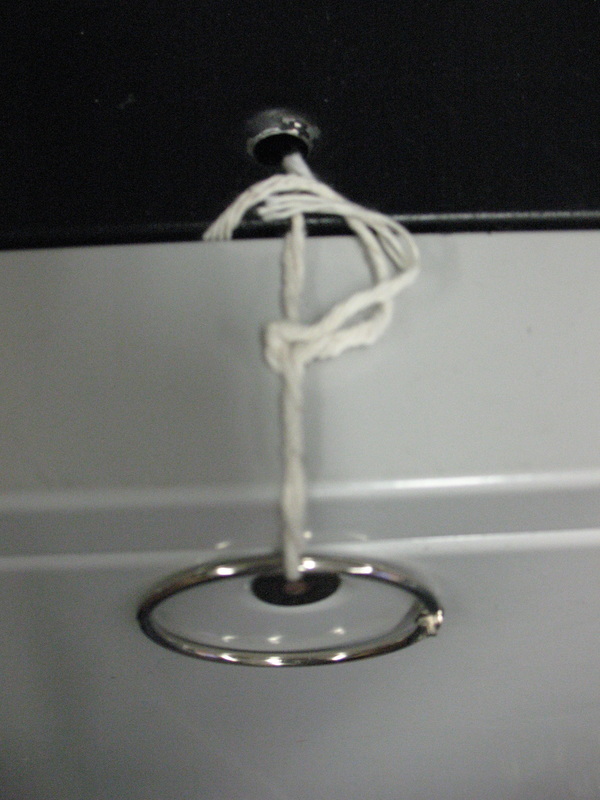 After pulling it taught, I strung it around the eye of a cable tightener (turnbuckle). In order to take out the slack, you turn the turnbuckle clockwise. Now the line is as tight as it can get! (Right): Once posters are hung on it, it will begin to sag again, so in order to prevent that I installed ceiling hooks with metal rings under my dropped ceiling, and screws with wire twisted around them in a drywall ceiling. 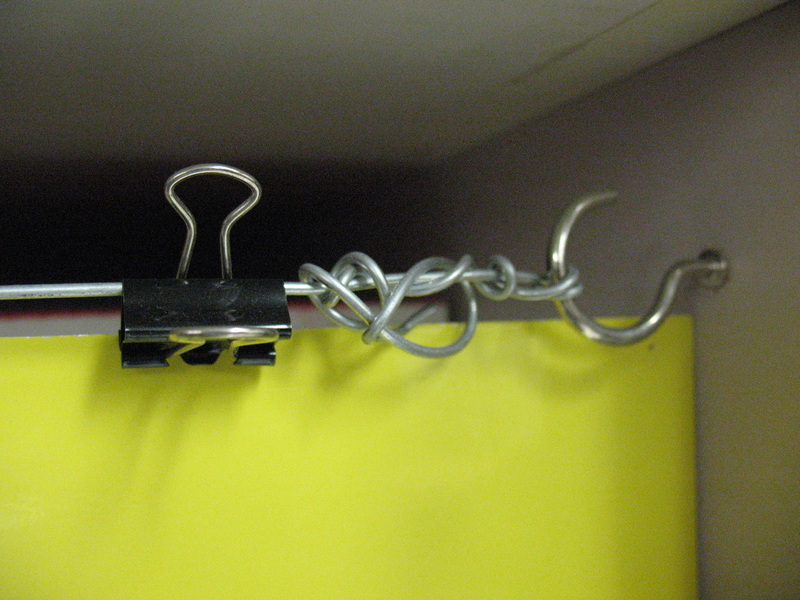 The binder clips are used to hold the posters. I love buying those long posters (like the one above) and making timelines that are 20 feet long, but I could never find a place to hang them! So I created a space under my cabinets and above the coat racks. Here's how I did it. (Left): On each end of the coat racks, I pre-drilled a hole an inch below the cabinets and inserted threaded hooks into them. Next, I twisted some wire until I felt it was secure (look at my professional job!). Then I pulled it taught, and did the same to the other side. I could have used a cable tensioner (turnbuckle), but I was able to use leverage to get it pretty tight. In order to prevent sagging, I screwed in some hooks under the cabinets and ran the cable through them. In order to prevent my posters and timelines from pulling away from the edges (they want to roll up), I put another hook below the poster, attached a binder clip & rubber band and the tension kept it secure. 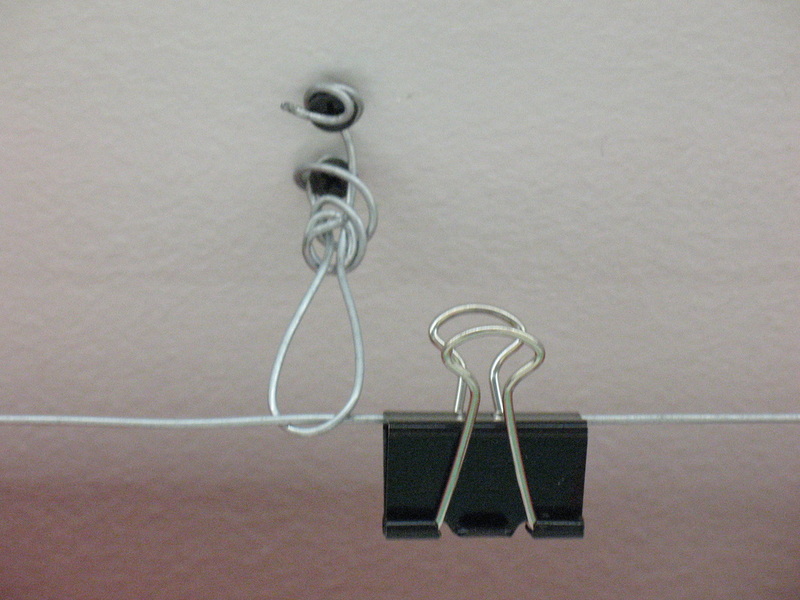 (Right): Binder clips above, hold it on the line. The posters and timelines hide my ugly storage! When I find something that works for me, I can go a little overboard! That has definitely been the case with me and literature organizers! 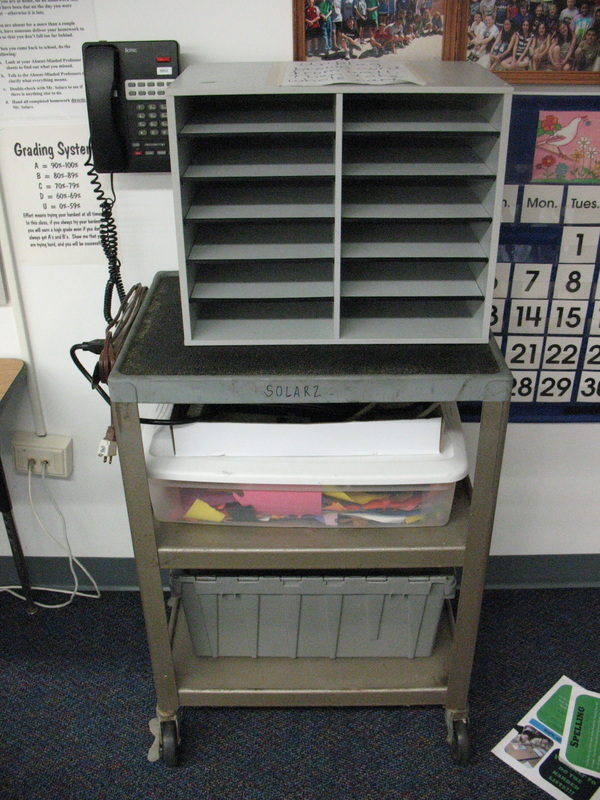 (Top Left): One of the ways I use them is probably the way that most people do: as mailboxes for student's mail. 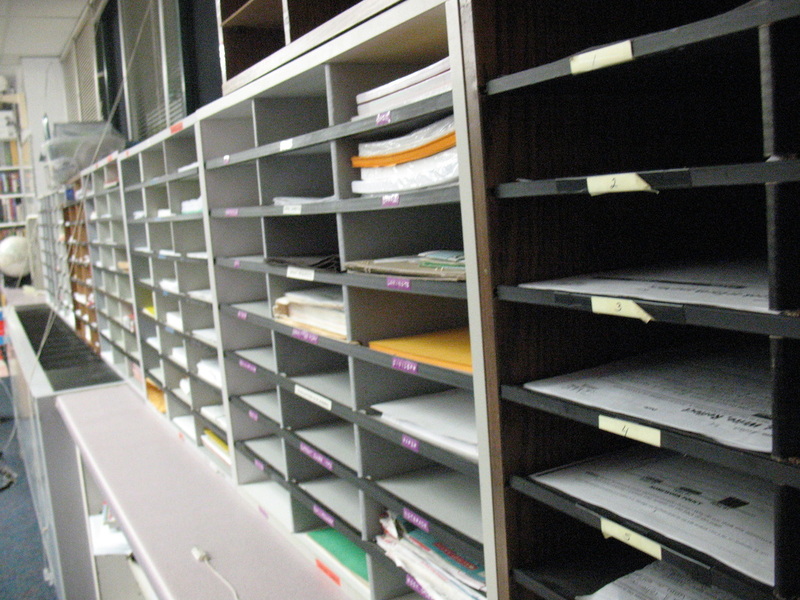 Every child has their number on the shelf and their mail gets sorted daily (graded papers, notes home, etc.). (Top Right): Along my windows, I use them in many ways. First, every student has a slot for their "Choice Time" work. This is individualized independent work that targets weak areas or areas for enrichment. 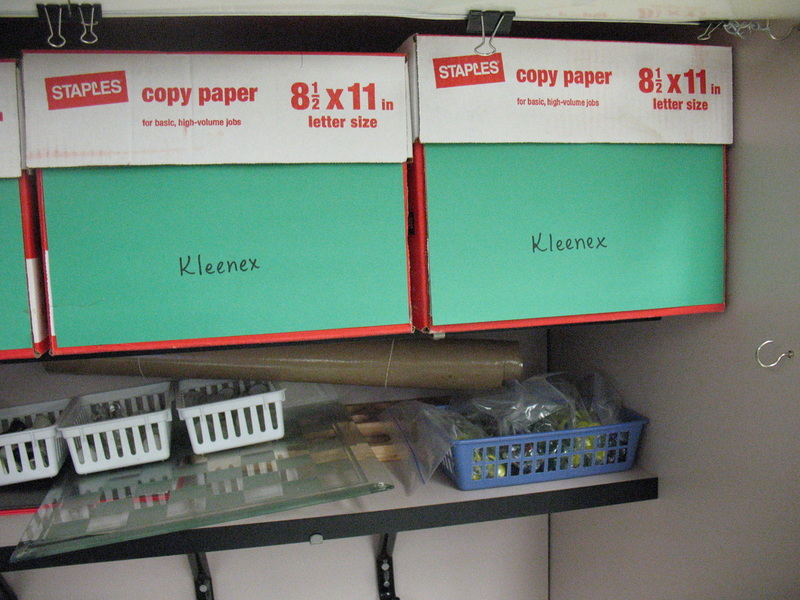 Other slots are used for sorting my Xeroxed worksheets for the week, lesson plans, handouts, etc. I also have slots for sorting through papers that have been handed in that I need to grade. It's a quick way to see if everyone turned their work in. 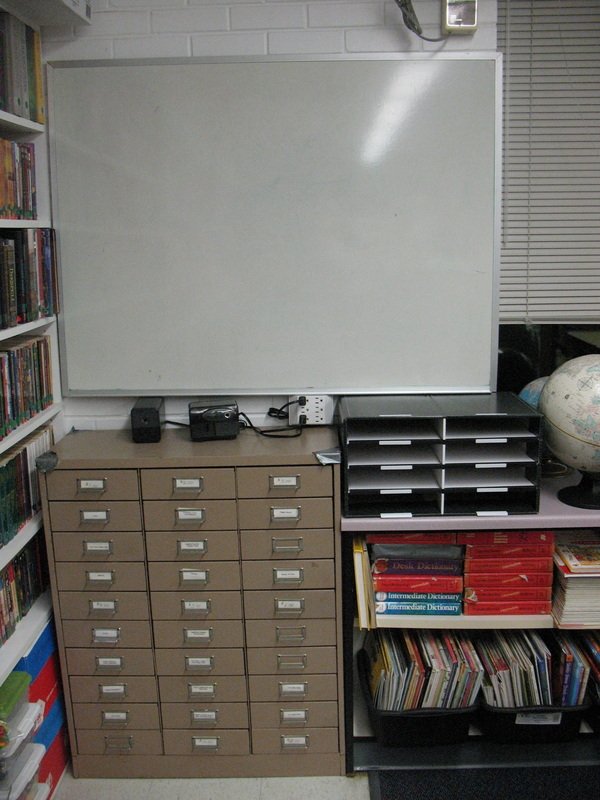 (Bottom Left): This is a small group breakout station in my classroom. Students work here without teacher support. 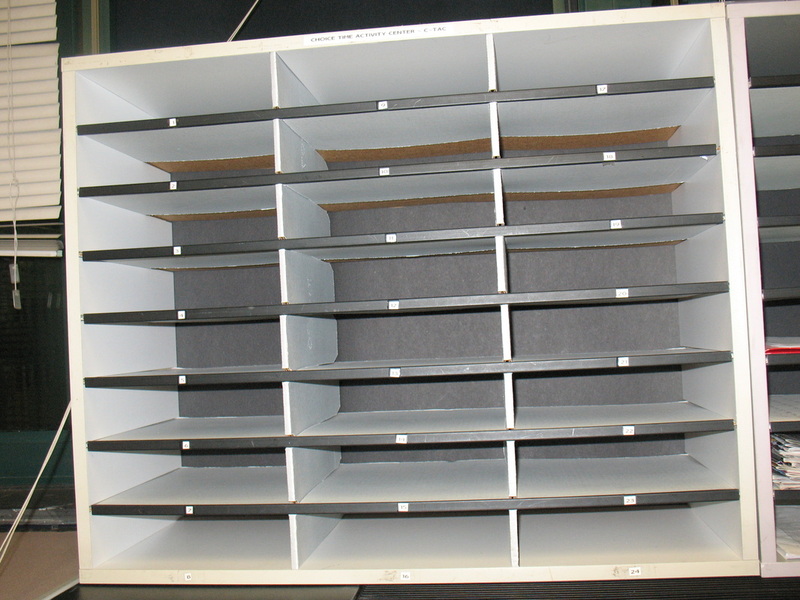 The metal slots have materials students might need for activities, while the black slots are where students turn in their completed work. 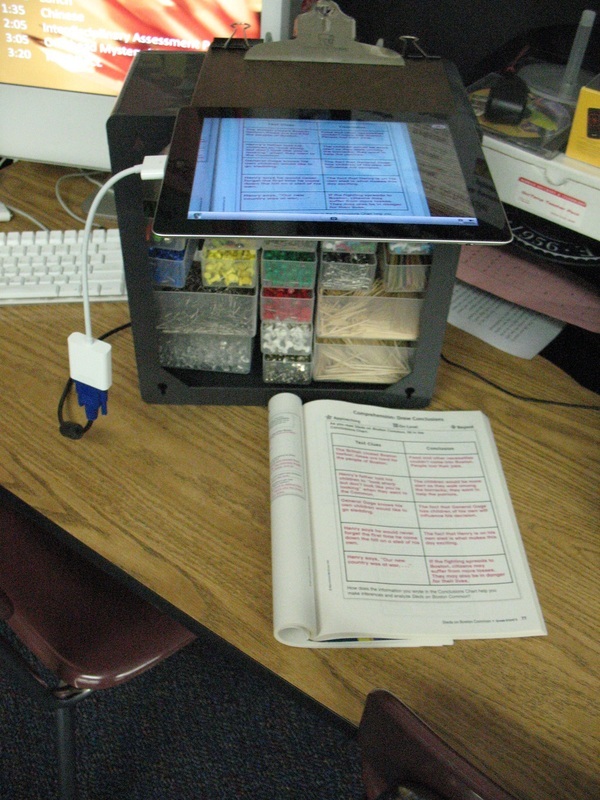 (Bottom Right): An iPad Cart. iPads go in the slots with their cords sticking out. Cords plug into power strips in the white box lid below, and the whole cart plugs into the wall. Hooks All Around the Room!!! They're 3M Command Strips. These Command Strips are very useful in a classroom! 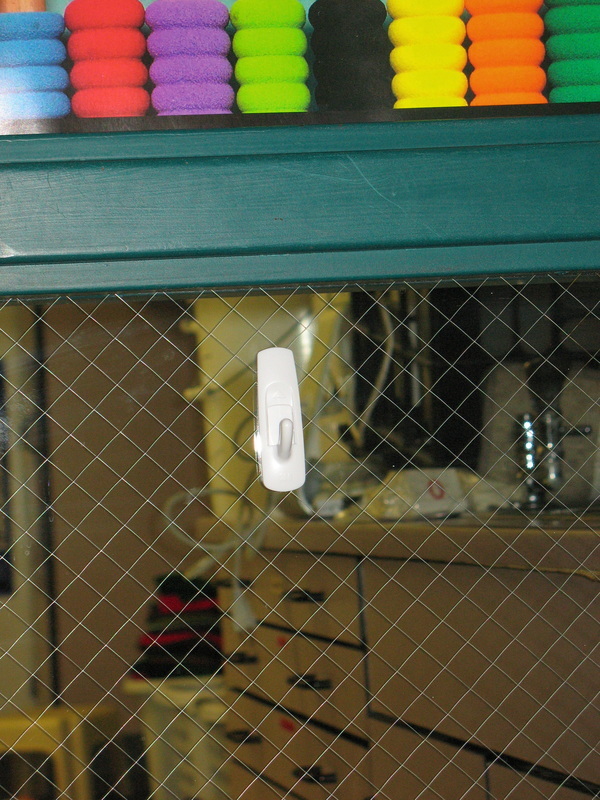 Since it can sometimes be hard or against the rules to drill holes in certain things (my classroom door, window, etc.) these sticky hooks can really save the day. 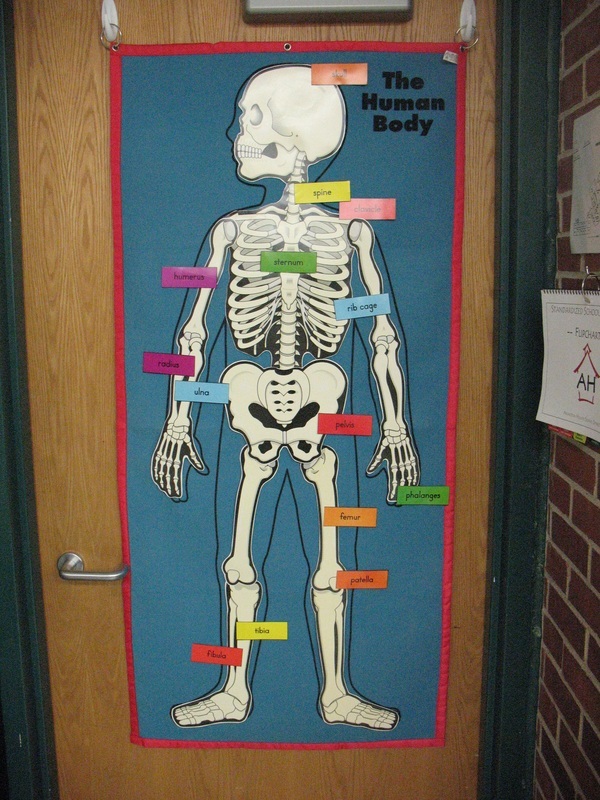 (Top Left): During my human body unit, I like to hang a full size Velcro outline of a body on my door and have the kids put the organs in the right places. 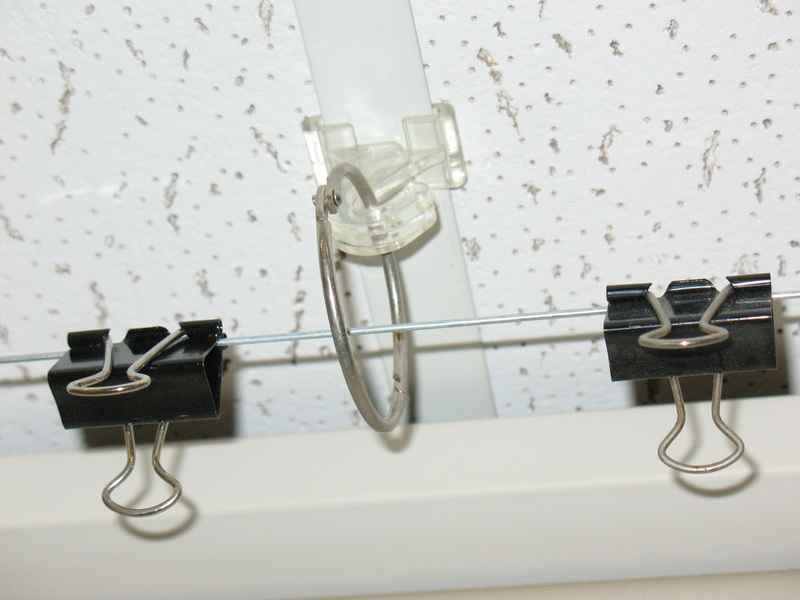 The hooks hold metal rings that are strung through holes in the Velcro outline. (Top Right): I have three hooks near my sink that hold a fly swatter, a feather duster, and a hand broom. (Bottom Left): Inside my closet door, I gain a little more space for hooded sweatshirts, teacher bags, my recess whistle, etc. For the heavier sweatshirts, I needed to use a heavy duty hook, but it's held well! (Bottom Right): This is next to my door just outside of my room. I put this here to hold the green bags that we get each day with fruit or veggies for those that order it for a healthy snack. It used to be put on my classroom doorknob, but then it would always prevent the door from closing or it would be on the outside of the door and the kids wouldn't see it. Now we see it as soon as it's delivered! 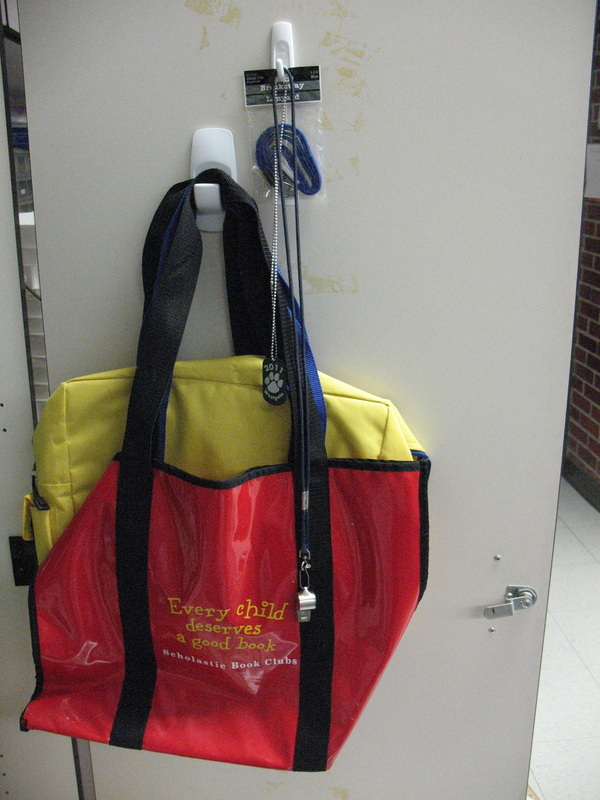 One of the reasons these are so great is because they are reusable and moveable. Just slide them up, pull the backing off the wall, and remove the sticky tape. 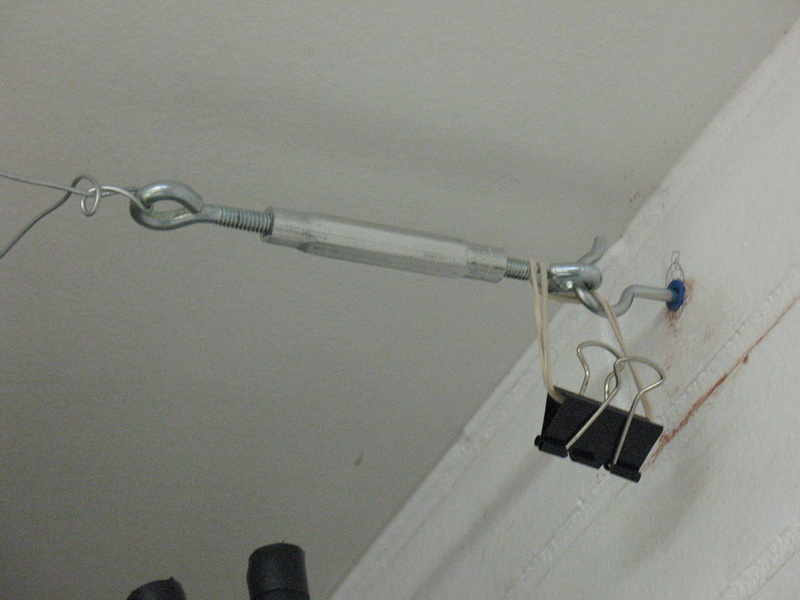 Put another sticky tape on, and place the hook in a new location! I like buying these small faux wood-grain three-shelf bookshelves. I had a few, then I saw a couple at a garage sale, and now I am using six of them in my room. 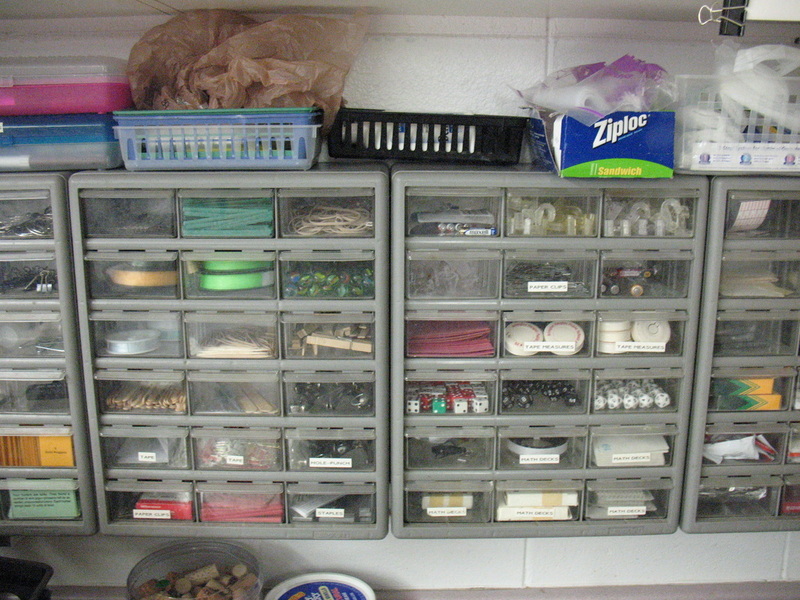 (Top Left): I have five of them being used to store materials for my students. 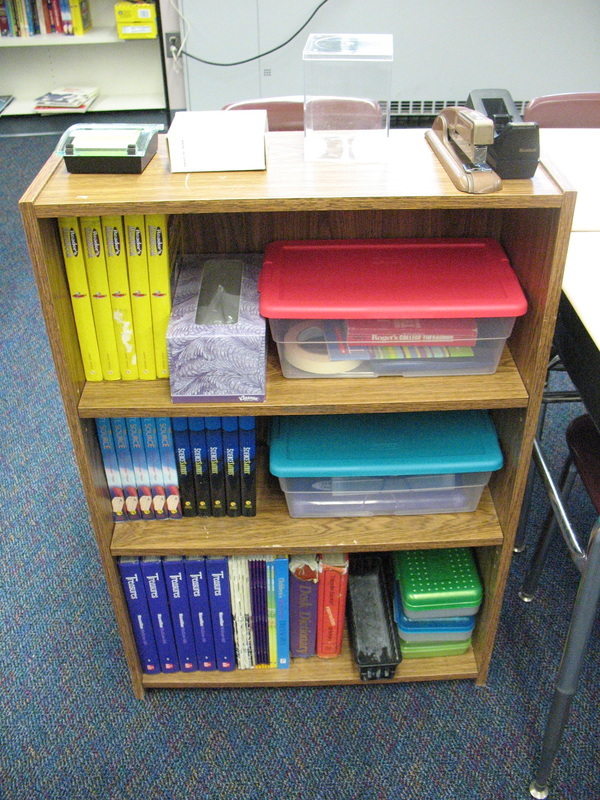 Each group of five desks has a bookshelf that has enough materials for each student. We keep the textbooks that we use sporadically, reference materials, staplers, tape dispensers, markers, Post-Its, scissors, calculators, etc. there. 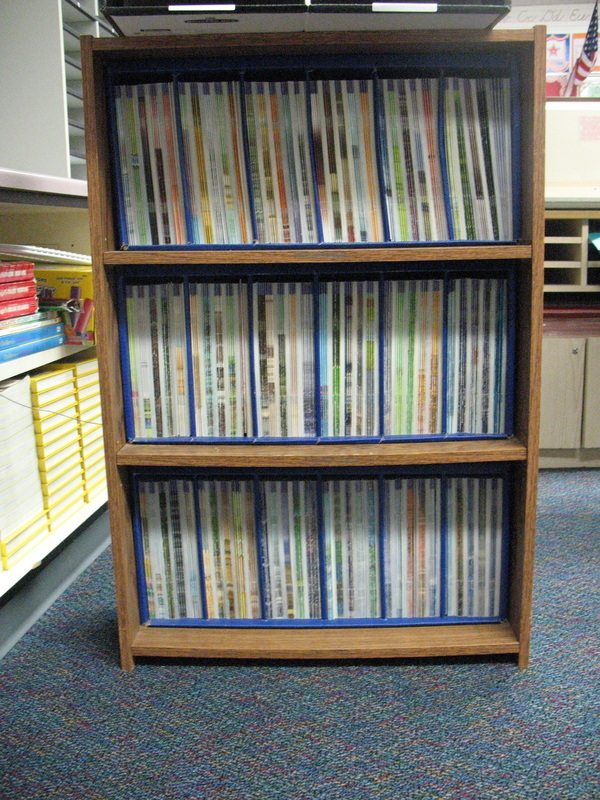 (Top Right): It just so happens that these particular bookshelves are the perfect size for storing our Treasures Guided Readers. But you do have to do one modification: you need to drill four new holes for the middle shelf. Put the books in on the bottom shelf and set the drawer on top. Drill the holes accordingly. 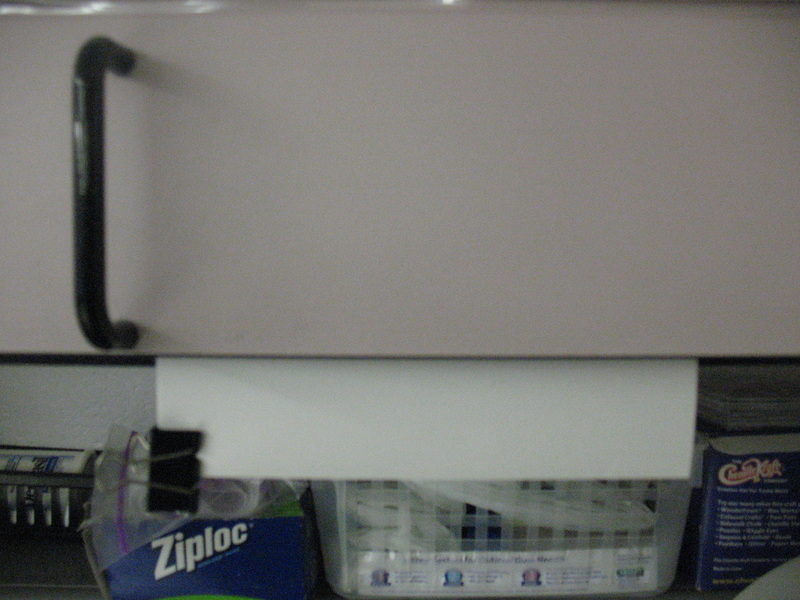 Plastic Utility Cabinets are Great for Storage and iPad Document Camera Stands! 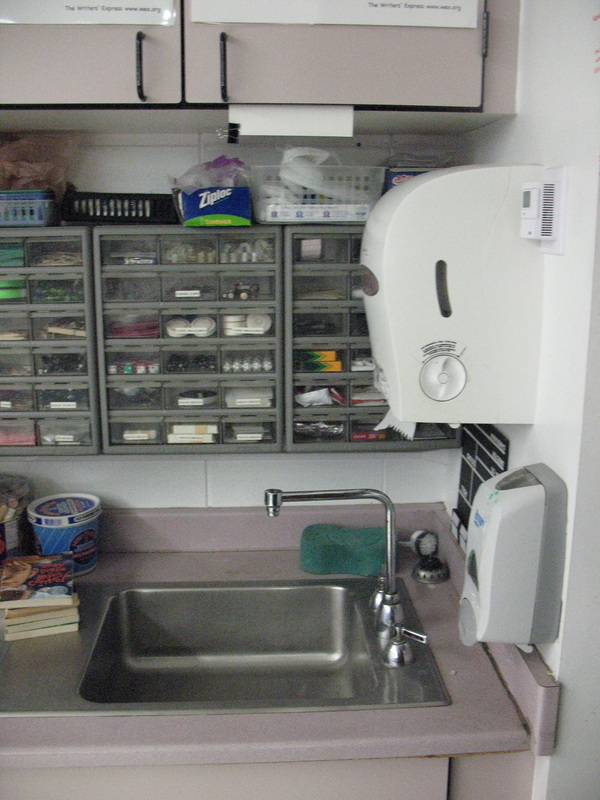 I use these plastic utility cabinets to store all of those supplies that normally reside in junk drawers and plastic bowls. (Left): They also work well as shelves above and below. I keep rubber bands, paper clips, science supplies, math manipulatives, chalk, Post-Its, etc. in these drawers. Most are accessible by the students, but some are restricted (e.g. rubber bands, thumbtacks, etc.). (Right): Due to its weight, it makes a nice iPad stand when you want to convert it into a document camera! 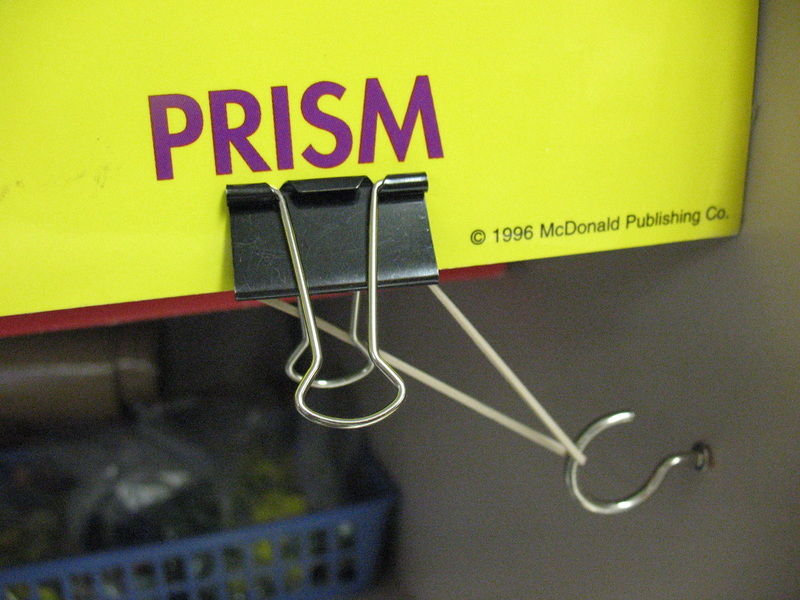 Just binder clip a clipboard to the top!